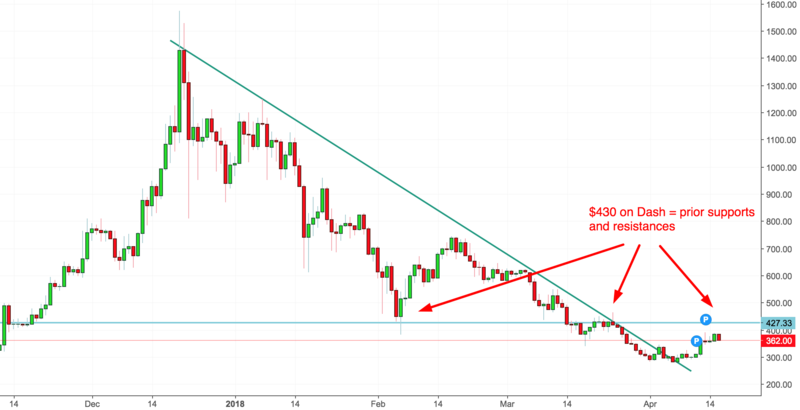 The major cryptocurrencies are stuck in a long-term bearish pattern of “lower highs and lower lows”. Bitcoin has broken above trendline resistance. Next resistance is at $9000. Ethereum is bumping up against trendline resistance. Bitcoin Cash is still going down in a “staircase pattern”. DASH has broken out above trendline resistance. Next resistance at $430. 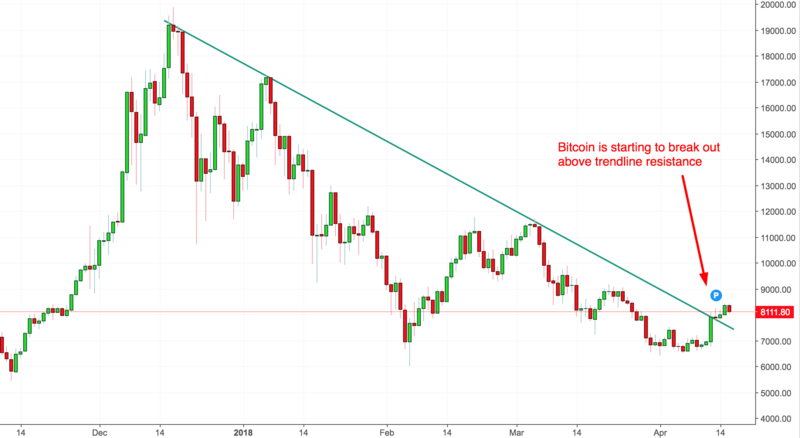 Although Bitcoin is still stuck in a long term bearish pattern of “lower highs”, Bitcoin has started to break above trendline resistance. This suggests that Bitcoin could make a bigger medium term bounce. Its next resistance is at $9000. Ethereum is weaker than Bitcoin. 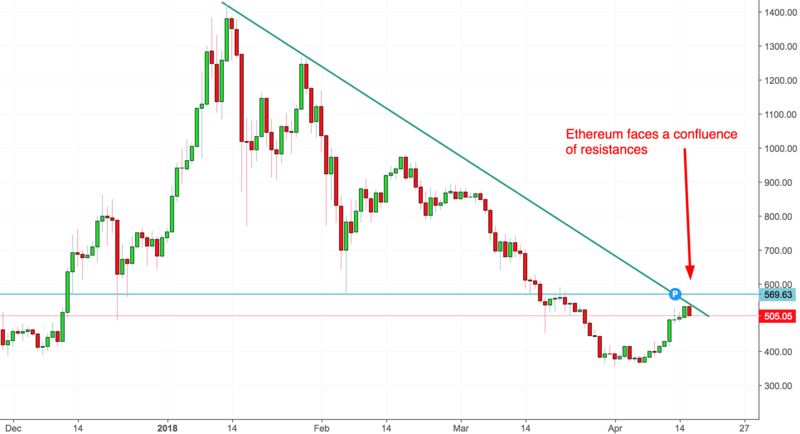 While Bitcoin has broken out above its trendline resistance, Ethereum is still stuck under this trendline resistance. Ethereum also has a confluence of other resistances at $570 (prior support and resistances). Bitcoin Cash is still going down in a “stair-case pattern”. Bitcoin Cash likes to crash, consolidate sideways, crash, consolidate sideways, crash, consolidate sideways… It goes down one level at a time. 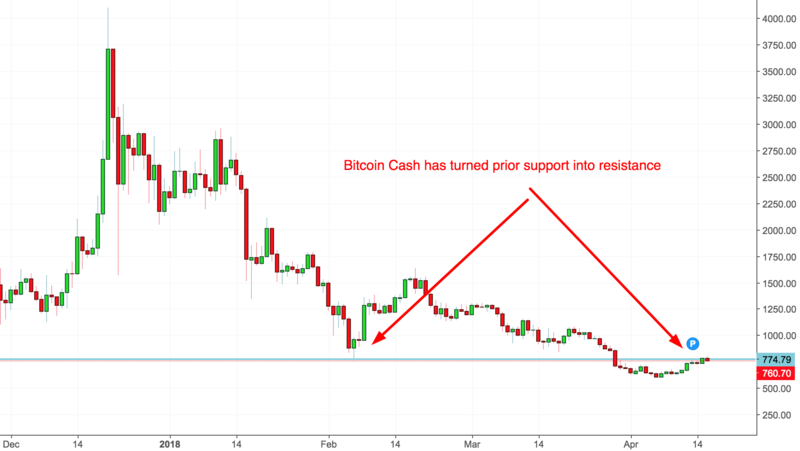 Bitcoin Cash has turned prior support into resistance. It has been unable to breakout from this resistance. Dash was one of the earliest cryptocurrencies to breakout above its trendline resistance. Its next resistance is at $430, which was prior support and resistance.